Earthtec is now shipped in case lots only. Available in a 4-pack of 1 gallon bottles. New Lower Price! Priced to save $10 per gallon off our regular single gallon pricing of $74.95 per gallon and that includes free shipping. EarthTec is the only algaecide of it's kind that we recommend and use, and it's replacing chemicals like copper sulphate, Cutrine, and White Cap for many pond owners looking for a safer, more eco-friendly way to control their algae problems in a larger pond. We suggest using EarthTec in ponds of 50,000 gallons or more. If you're a large pond owner who's been using copper based algaecides to treat algae problems...stop! And take a minute to read why there's a better way to deal with algae in your pond. For years, products like copper sulphate and Cutrine have been used to chemically deal with algae problems in ponds. It's well known that copper is toxic to most algae and when treated, the algae will often die off quickly. But there's a price that your pond pays for that. Although it may look clean and pristine on the surface, the fact is, the algae that once thrived there is now rotting at the bottom of the pond. Do a little research on what ultimately feeds algae and you'll come to find that this dead algae is much like compost in your garden. As it decays, it releases substances that help feed more algae growth! To make matters worse, if the natural processes in your pond can't reduce this compost fast enough, you'll potentially end up with a stinky muck at the bottom of the pond. And since copper sulphate tends to settle at the bottom, you'll end up with high levels of copper right where you don't want it to be. You see copper, while toxic to algae, is also toxic and deadly to good bacteria in your pond. Ideally it would be best if you didn't use copper at all to treat algae problems, but the reality is, many people still rely on it for algae control. If this is the case with your pond, then you need to know about a better option. EarthTec® Algaecide is very different from conventional treatments. First, unlike copper sulphate, which can be viewed as a "heavy" form of copper, EarthTec® won't simply drop to the bottom of the pond and stay there (where it ultimately won't do much good over the long term). 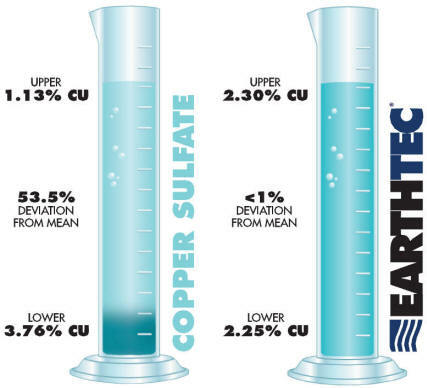 Unlike all other copper sulfate water treatment products available today, the copper in EarthTec® is already fully dissolved, and more importantly, the release of the cupric ion is controlled by biological demand instead of by water conditions. These unique characteristics allow you to achieve long term control of algae without overtreatment. Until they encounter their targets, the copper ions in EarthTec® remain suspended indefinitely without settling out or adding to bottom sediment. Check out how EarthTec® compares with imitators in a sediment test below. The unique, self-dispersing properties of EarthTec® allow even distribution without spraying, mixing or agitation. EarthTec® is non-toxic to humans or fish when used as directed. In other words, because it's so "light" it will remain active, right where it needs to be in the pond, to be absorbed by algae cells as they are forming, and before they get to be a major eyesore for your pond. In comparison, you will often find that you can treat your pond less frequently, with less product, at a lower copper concentration, than you would with either copper sulphate or Cutrine. Because the best way to use a copper based algaecide is not necessarily as a treatment. Of course there may be times when you need to do this, but ideally, you want to use a product like EarthTec as a retardant. In doing so, you avoid creating any unwanted build up of dead and decaying algae, and by keeping copper levels as low as possible, you minimize the impact on the beneficial bacteria at the bottom of the pond, which is so vital to the on-going clean up work that keeps a pond healthy. So the bottom line is this. While we personally believe that beneficial bacteria treatments are the very best way to deal with many unwanted problems in ponds and they have the power to restore a pond back to better health, there will be cases where a pond owner must resort to something like a chemical treatment for their algae problems. Also since algaecides have been used for many years, many people have simply come to rely on them, for better or for worse. Earthtec is toxic to Trout. Do not use in water containing Koi or hybrid Goldfish. *All pesticides can be harmful to health and the environment if misused. Read the label and follow directions. Consult with your local regulatory agency before applying herbicides and algaecides to public waters. Simply pour in the recommended amount of EarthTec. Dosage charts can be found below. EarthTec® will rapidly and evenly self-disperse throughout the body of water to which it is applied — without mixing or agitation, minimizing equipment and labor costs. Regardless of dilution rate, the active ingredient in EarthTec® will always be uniformly distributed. Lake and pond water may be used immediately following treatment for irrigation without harm to plants or grass. EarthTec® may also be used in fish-bearing ponds at prescribed application rates. As with any algaecide (including Algae-Off Algaecicde) or chemical that can kill algae and vegitation quickly, care should be given when applying this product in a pond with fish. It is best to use maximum aeration during the treatment phase to ensure adequate amounts of dissolved oxygen are maintained in the pond. If the algae bloom is heavy and widespread, it may be desirable to use a one time treatment of copper sulphate in which you can spot treat sections of the algae over a period of time. Doing this will reduce the chances of oxygen depletion in the pond and once cleared, clarity can be maintained with EarthTec. Under no circumstances should a copper based algaecide be used in a pond with trout or other species sensitive to copper. In our use of the product we like to follow the recommended initial dosing instructions as suggested below. For follow up treatments, you can use the 14 day cycle as outlined below, or routinely test the amount of copper concentration in your pond every two weeks. The goal is to maintain the copper level at or around 0.06 ppm, or the lowest level of possible for effective algae control. The dosage rate may vary from pond to pond as well as the species of algae you are trying to treat. To treat be sure to figure water volume in gallons (length x width x average depth x 7.5). Apply initial dosage of EarthTec® every 14 days until visible algae disappear. Then apply maintenance dosage of EarthTec® every 14 days or test to maintain recommended copper concentration in the water. See charts below. This product did as it was described. Kept string algae down well. It took a bit in the first couple of applications to get things cleared up but once that was done, maintenance required less of a dose.